Motivation for fitness is found at Hitch Fit Gym in Kansas City. Motivation for Fitness at Hitch Fit Gym! Home/Success Stories/Motivation for Fitness at Hitch Fit Gym! Transformation by Hitch Fit Gym Downtown Kansas City Personal Trainer (Transformer) Joel Salter! 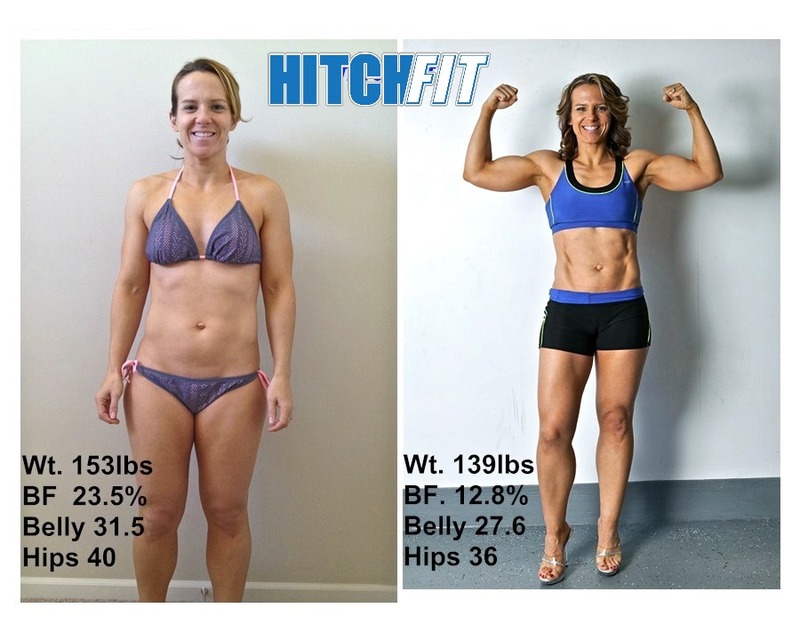 Joellen found her Motivation for Fitness at Hitch Fit Gym and shed over 10% body fat! Motivation for Fitness and a Plan of action at Hitch Fit gym leads to 6 pack abs! Over 10% body fat lost! Before and after back pictures after losing 10% body fat. “As a working mom, I was proud of the fact that I had made exercise a priority in my life. Once a collegiate athlete and now a self-proclaimed gym rat, I had a pretty good idea of what it took to create a good exercise program, and stick to it. At 35, I was in as good as shape as I had ever been in. But something was still missing, and I kept hearing myself say, “I’ve hit a plateau.” Even though I had a muscular build, I wasn’t lean or as “cut” as I had hoped to be. And now hitting that mid-thirties mark, Mother Nature was massing an assault on my lower body with that dirty curse word…..cellulite. I knew that I was essentially repeating the same workouts over and over, and I needed a shock to the system. So I tried a few different things like P90X and the Insanity program. I was about half-way through Insanity when I saw a Groupon for two personal training sessions through Hitch Fit, a company I wasn’t familiar with at the time. Even though I thought I was making good progress with the Insanity program, the Hitch Fit Groupon was a great deal and I couldn’t pass it up. With so many reservations in my head, I first met Joel ready to say no to whatever he was about to try to sell me. Since I’d been in the gym setting for so long and had witnessed the same cookie-cutter workouts that most personal trainers push on you, what could he possibly offer me that was different? I’d collect on my two personal training sessions with him and move on. But he explained to me he wasn’t pushing a gym membership. He was offering the opportunity to transform me into whatever I wanted to be, to get me over any plateau that I couldn’t quite conquer on my own. And it didn’t feel like a gimmick. He took my measurements the first time I met with him and I was at 24.5% body fat. Since I considered myself to be fairly muscular, it took me a little by surprise. But since I was only halfway through Insanity, I was hesitant to start yet another program without finishing out the first. He wasn’t pushy at all. He told me to come back when I was done with it, and we’d see where I was at that time and how I felt. Four weeks later, having put my body through a very grueling cardio/plyo workout program with Insanity, I was sure I had made great gains. So he measured me again…….23.5%. I had barely lost 1% body fat in four weeks!!! I hadn’t changed my diet much, but I honestly thought I was a good eater. No fried foods, lots of fruits and veggies, whole grain breads and pastas. But, there was that one tiny issue of a minor sweet tooth…..okay, so it was a MAJOR sweet tooth that reared its ugly head every night after dinner that would put most people to shame. Then Joel said something that made me nearly fall out of my chair. “That’s no problem. I’ll curb that sweet tooth, and I’ll put you on a program that will take off 1% of body fat a week.” Say what?!?! Was he out of his mind?!?! He said if I was willing to dedicate myself to the diet he created for me, and meet the workout requirements needed each week, he would get me to 13.5% body fat. But there was something about the way he said it. He was so matter-of-fact, as if he had absolutely no doubt in his mind that he could get me there. Later on, I figured out that’s exactly what he meant! It was a big leap of faith for me, but I’m so glad I jumped! through aisle, what I thought were smart healthy choices were quickly humbled by a text response from Joel saying, “Nope, put it back. Try this instead.” My sweet tooth was quickly contained with an endless amount of protein shake recipes he supplied me to supplement the late night cravings. I had also never mastered the art of batch cooking. But eating as often as I did throughout a busy work day, it was a discipline that came much easier to me once I knew what I needed to prepare.